Overview: IMPERIOUS REX! Kneel before the prince of Atlantis, Namor the First, a.k.a. the Sub-Mariner! Having been a frequent foe in the pages of the Fantastic Four, Namor becomes the hero of his own feature in 1965. The majority of this Essential collects the Sub-Mariner’s run of stories in the pages of Tales to Astonish, an anthology featuring two characters each month. So each story is roughly 10 pages, and Namor is featured on alternating covers. At this time, Namor has regained the throne of Atlantis, and must do everything in his power to protect his people from the likes of Krang, Attuma, and Byrrah, as well as the air-dwellers above the seas. What makes this an interesting collection is we finally get to see him interacting with other heroes in the Marvel Universe. The first book in this collection, Daredevil #7, has Namor seeking counsel to represent him in a suit against mankind. Murdock & Nelson turn down the request, due to lack of evidence, and Daredevil is forced to stop the rampaging Namor. The art in this issue is done by the legendary Wally Wood. During the TtA run, we get a team-up with Hank Pym and the Wasp, from the pages of the Avengers. A few issues later, we are treated to a team-up crossover with Iron Man, who was a co-feature in the Tales of Suspense book at that time. What makes this Essential? : Once again, this is a book that you pick up first for the art. Gene Colan’s art just leaps off the page. We get the noble Namor who is looking to protect Atlantis and the oceans from the surface-dwellers, which is just one of his many aspects. However, the stories just don’t stand out to me as memorable. Little bits of pieces of action strung together for ten pages, only to be continued in the next issue. 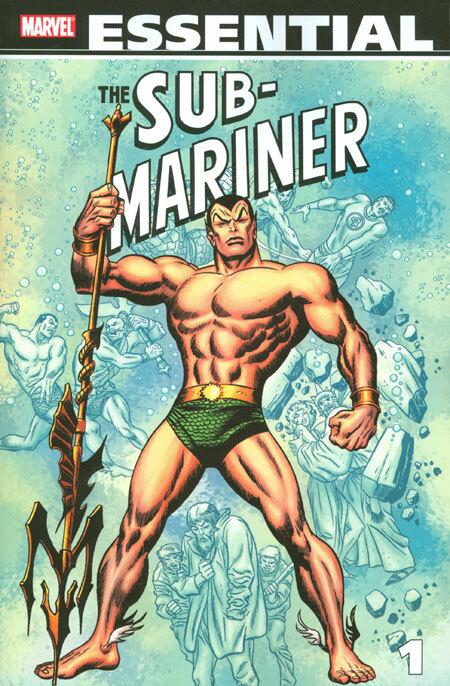 It’s disappointing that the Essential line has ended, because I think a second volume of Sub-Mariner would have taken us into a more interesting era of the character, with a greater focus on the Atlanteans around him – not to mention the art by Buscema and Severin. Guess it’s time to hit the back issue bins! In The Beginning…. : While this collection focuses on Namor in the Silver Age of comics, the Sub-Mariner is one of the most important characters from the Golden Age of Marvel Comics. In fact, he made his first appearance in Marvel Comics #1 (October 1939). Then known as Timely Publications, the company that would someday become Marvel introduced in this first issue the original Human Torch, the Sub-Mariner, the Vision, the Angel, Ka-Zar and more to an audience hungry for new characters and concepts. The initial press run of Marvel Comics #1 was 80,000 books, but the popularity of the book sent it back for a reprinting. That second print run was for 800,000 copies. Footnotes: The Sub-Mariner replaced Giant-Man as the co-feature (along with the Hulk) in Tales to Astonish #70. Following issue #101, Tales to Astonish was given over to the Hulk, keeping the numbering but changing the name (The Incredible Hulk #102). Daredevil #7 is also reprinted in Essential Daredevil Vol. 1. Tales of Suspense #80, Tales to Astonish #82, and Iron Man & Sub-Mariner #1 are also reprinted in Essential Iron Man Vol. 2. If you like this volume, try: the 1990s Namor series by John Byrne. Following numerous runs with many of Marvel’s top characters (X-Men, Fantastic Four, Alpha Flight), Byrne turned his attention to one of Marvel’s first characters. As with any new project, one gets the opportunity to re-invent the character to fit the story. (For example, just a few years ago, Namor was re-invented as “the first mutant”, giving him a good excuse to hang out with the X-Men.) In this situation, Namor becomes a shrewd businessman with his own corporation, going head-to-head with eco-terrorists and others looking to exploit the oceans. While generally depicted as the antihero in many comics, Namor is truly a hero in this title, albeit working towards his agenda, which is not necessarily the most right or fair course of action. With Byrne at the helm, you can expect lots of cameos from the Fantastic Four, Namorita, Captain America and others. The first 18 issues have been collected into two Marvel Visionaries trade paperbacks, which are still readily available. Overview: Welcome back to the world of Asgard, home of the Norse gods. Led by all-seeing Odin and served by his dutiful son, Thor, god of thunder and protector of Midgard (Earth). These comics expand the adventures of the thunder god to cosmic proportions. Odin sends Thor on a journey into mystery to track down the world-devourer Galactus. Later on, Odin and the Silent One travel into the universe to face Infinity, and they must call on Thor to rescue them from oblivion. As always, we see the ambitious Loki looking to take the throne of Asgard for himself, leading multiple attacks by giants and trolls. As cosmic as this volume gets, Thor remains true to Earth as well. Deadly encounters with the Wrecker and Doctor Doom challenge Thor to his very limits. Thankfully, with his loyal friends like Balder, the Warriors Three, the Lady Sif, and even the Silver Surfer, Thor finds himself to be worthy of any task or challenge laid before him. What makes this Essential? : For the artwork alone, this volume should be in any collection. With art by Jack Kirby, Neal Adams, and John Buscema, there is not a badly drawn issue to be found in this book. You can see the majesty of Asgard jumping off of the page; the thunderous rage of Thor; the evil manipulations of Loki. This is just a beautifully drawn book. However, this is not Stan Lee’s best writing. For all of the talk about comics of today being written for the trade paperback, Stan Lee was doing it 40+ years ago. The stories in this volume stretch out across multiple issues; ten years earlier, Stan and Jack would have the stories done in one issue, or two tops. If you can find the book, pick it up for the art. Footnotes: This is a hard Essential to track down. Marvel published this in June of 2009, but no re-issues or second editions have been released since then. Given the character’s popularity with the movie franchise, it’s surprising that this has not been kept in print, especially given the talents who worked on these issues. If this is not currently in your collection, you may need to turn to eBay in order to find this volume. Kirby left Thor (and Marvel) in 1970 due to contract issues, and took his services over to DC Comics. One of Kirby’s first projects at DC is what would become to be known as the Fourth World saga, with the introduction of Darkseid and the New Gods. There is enough examples to note that the New Gods’ origins came with Kirby’s work on Thor over the previous eight years. Check out Comic Book Legends Revealed #444 over at Comic Book Resources for a complete recounting of how Kirby was building the New Gods concept. 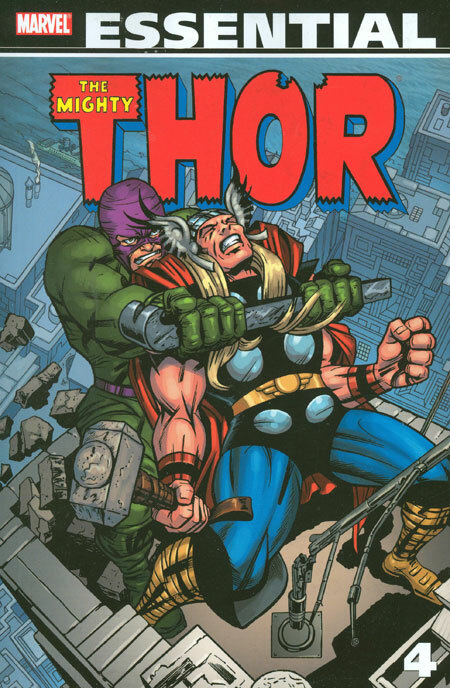 If you like this volume, try: the incredible run on Thor by Walt Simonson. This is the ultimate run by any single creator on this title, elevating Thor and Asgard to new heights. Simonson introduced Beta Ray Bill, an alien who was just as worthy as Thor to hold Mjolnir. We witnessed Ragnarok as the great winter storms took over the world. And the mischievousness of Loki reached new lows as he turned his step-brother into a frog. This has been collected numerous times, as trade paperbacks and most recently as an oversized omnibus. However you choose to read this, the Simonson Thor should be part of every comic library. Overview: Free at last, free at last! The Silver Surfer is free of Earth, and spanning the galaxy in Essential Silver Surfer Vol. 2. Sit back and enjoy the ride, as our cosmic-powered hero finally goes cosmic. Back when the Silver Surfer first appeared, he was a herald of Galactus, but rebelled against his master to protect Earth. As a result, he was punished to live out his days on Earth, inside an invisible barrier Galactus erected surrounding the planet. But leave it to the genius of Reed Richards of the Fantastic Four to figure out a loop hole, which releases the Silver Surfer from his confinement. Once again free to roam the stars, the Silver Surfer travels back to his home planet of Zenn-La and his beloved Shalla Bal. He finds his home world caught up in the ongoing conflict between the Krees and the Skrulls. The warring races, and the political intrigue taking place behind the scenes, would provide the direction for the series. With the entire Marvel Universe at his disposal, writer Steve Englehart allows the Silver Surfer to encounter many of the cosmic beings – from Galactus and Nova to the Eternals and Mantis. This volume also collects some assorted solo stories of the Silver Surfer that appeared in this era. Two tales written by Stan Lee, with art by John Buscema and John Byrne, start off this collection. And an unused story from Silver Surfer #1 finally sees print in 1990 in the pages of Marvel Fanfare (see Footnotes below). What makes this Essential? : This book highlights an interesting change in the direction of the Silver Surfer character. The first Silver Surfer series from the 1960s, collected in Essential Silver Surfer Vol. 1, dealt with ethics, morality, race and other topics. The Silver Surfer was the voice of Stan Lee in the pages of the comic books, giving him a chance to wax poetic on whatever interested Lee at the time. I would contend that the Silver Surfer of this era was more of a philosopher and not a super-hero. Now over the 1970s and early 1980s, we did see Silver Surfer used, primarily in the pages of the Defenders, but he was never the focus of that title. It’s not until the 1987 series launch, collected in this volume, where we see the Silver Surfer go back into space and become a cosmic super-hero. This Silver Surfer is more likely to dive into action versus sit on his board and think about the petals on a flower. Not that there is anything wrong with that. Bottom line, if you want an action hero, you will enjoy this volume. 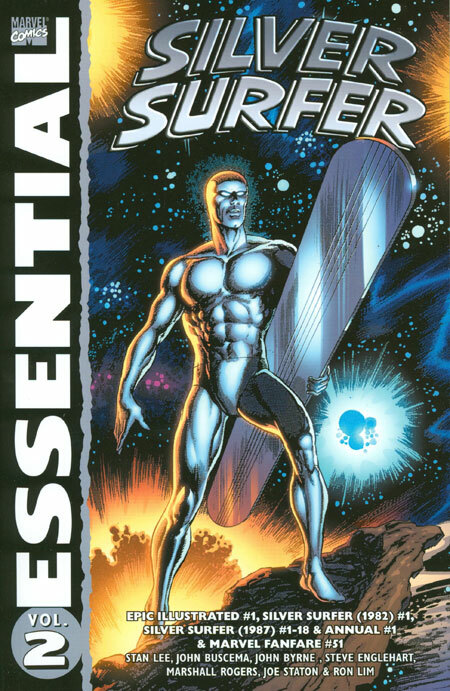 If you prefer the Silver Surfer seen in the first Essential volume, you may not like this edition. 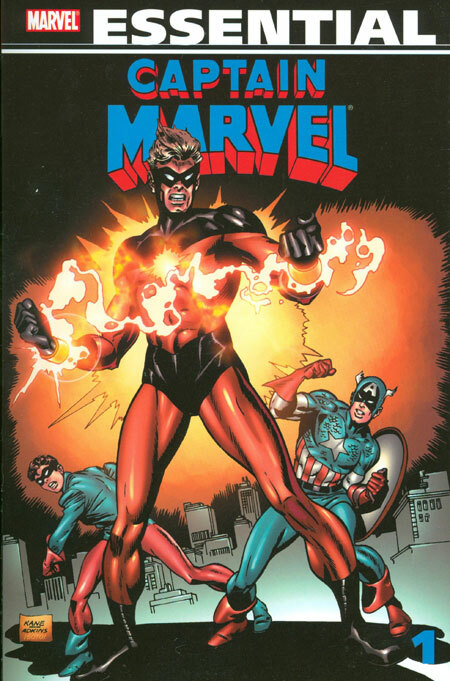 Footnotes: The cover to Marvel Age #52 is included in this volume. In that issue, there was an article on the then pending release of the new Silver Surfer series, which starts in this Essential. The article is reprinted in this volume. The Silver Surfer story from Marvel Fanfare #51 was originally intended to be the first issue of the 1987 series. Before it could be published, Marvel editorial agreed to allow the Silver Surfer to be released from his imprisonment on Earth, once again allowing him to span the galaxy. The original issue was shelved, and a new #1 was quickly put together. Not willing to let paid work go unused, Marvel later dug out the finished issue and included it in Marvel Fanfare. If you like this volume, try: the 2014 Silver Surfer series from Dan Slott, Mike Allred, and Laura Allred. Free from Earth once again, Silver Surfer encounters an Earth woman, Dawn Greenwood, who becomes a new companion for Norrin Radd on his travels. I use the word ‘companion’ on purpose, as this title has a strong ‘Doctor Who’ feel to it, in terms of it’s timey-wimey elusiveness. This is some of Slott’s most creative writing to date, and the Allreds work feels like it is a direct descendent of Jack Kirby. The first trade paperback collection just came out in October, so rush back to your LCS to pick up a copy. Overview: Let’s set the scene here. Jack Kirby has just recently left the Fantastic Four (and Marvel). If this had happened in the last 10 years, more than likely Marvel would have cancelled the book and relaunched it the next month with a new #1. But in the 1970s, the book must go on month after month, so welcome aboard to Archie and Roy and Gerry and John. You have big shoes to fill, so let’s see how you do in Essential Fantastic Four Vol. 6. Let’s bring in some familiar foes. Doctor Doom? Check! Galactus and his new herald Air-Walker? Check! The Frightful Four? Check! Dragon Man? Check! Diablo? Sigh, check. But we also get some new challengers, such as the Overmind. But the most treacherous foe is finally shown in Walter Collins, the constantly irate landlord of the Baxter Building. (“Johnny, what did you do with the rent check?”) Thankfully, John Byrne was finally able to have Reed write off Collins years later during his fantastic run of the 1980s. The most interesting introduction in this volume is Thundra, who comes from the 23rd century when Earth is ruled by Femizons. She travels back to the 20th century to fight the strongest man, who happens to be Ben Grimm. Thundra will become a familiar face in the pages of Fantastic Four, working as an ally of our heroes and as an enemy as a member of the Frightful Four. She eventually develops a romantic interest in Ben, much to his chagrin. What makes this Essential? : I want to like this more, I really do. But this volume just feels like a let down after the Lee-Kirby run. Maybe it’s not fair to compare these issues against that run, but this is the situation. The stories are decent but not dynamic. The art is very good but never breathtaking. There are some moments that rise up close to greatness, but then I wonder how Lee & Kirby would have done it. Case in point, in Fantastic Four #116, Doctor Doom leads the Fantastic Four against Overmind and Mr. Fantastic, I loved the issue, but I wanted to see Kirby draw that issue. 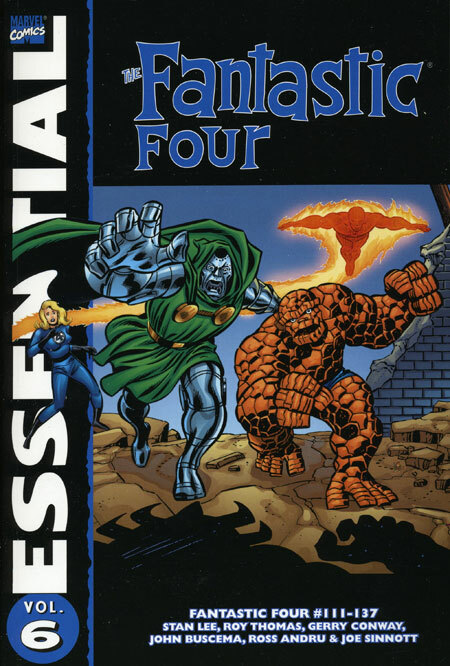 A Fantastic Four completist should own this volume, but it is not essential for a casual Marvel fan. Footnotes: The front and back covers to Marvel Treasury Edition #21 (1979) are included in this volume. The treasury edition reprints Fantastic Four #120 to #123, which are collected in this Essential. In addition, early versions of the covers to Fantastic Four #130 and #131 are also included in this book. If you like this volume, try: the Inhumans mini-series from 1998. Written by Paul Jenkins with art by Jae Lee, the 12-issue series was part of the Marvel Knights launch. Several story arcs are at work in this collection: Attilan is under attack from external and internal forces. The next generation of Inhumans debate their future before entering the Terrigan Mists. And the royal family shows that they are just as dysfunctional as any other family. The tale fills in the gaps in the Inhumans history, fleshing it out into an epic story. This is one of the best Marvel stories ever, and probably needs to be read multiple times to catch everything. This has been collected repeatedly in trade paperback and hardcover editions, so it should be easy to find. Overview: Welcome back to the continuing adventures of Captain America and the Falcon. This volume features an all-star list of comic greats, as Stan Lee and Gene Colan wrap up their long run on the book, and familiar Marvel Bullpen creators like Steve Englehart, John Romita, Sr., and Sal Buscema get their chance to take on star-spangled superhero. Our duo continues helping out Nick Fury, Sharon Carter, and S.H.I.E.L.D. with a variety of familiar foes, such as the Red Skull, Hydra, and the Grey Gargoyle. Heroes like Spider-Man and the Avengers make cameo appearances, as New York City is the hub for all Marvel super-heroes. Now, one of the struggles for our title character is to find something to occupy his time when he is not in costume. Sam Wilson works as a social worker in Harlem, and now has a steady girlfriend in Leila Taylor. But what can Steve Rogers do? Well, with good intentions, he joins the New York City Police Department. He works with Police Commissioner Feingold to set it up, but they agree to tell no one of Rogers’ other identity. Of course, this leads into all kinds of crazy excuses that Rogers must come up with to explain missing his shift, much to the annoyance of Rogers’ sergeant, Brian Muldoon (who bears a solid resemblance to Jack Kirby, one of Captain America’s co-creators). What makes this Essential? : This volume really has me on the ropes. I don’t want to write a negative review about it, but I don’t know that I can write a positive review either. Given the incredible talents of the creators involved with the volume, one might expect the stories to be more epic in nature, or even more memorable. I don’t believe they were phoning it in during this era, but this is one of those books that felt like priority 1 was to just get a book out each month. This is a very good read for the Captain America fan, but I believe the casual Marvel Universe fan will find it disappointing. Footnotes: Captain America Special #1 (1971) and #2 (1972) are reprint issues. collecting previously published stories from Tales of Suspense and Not Brand Echh. 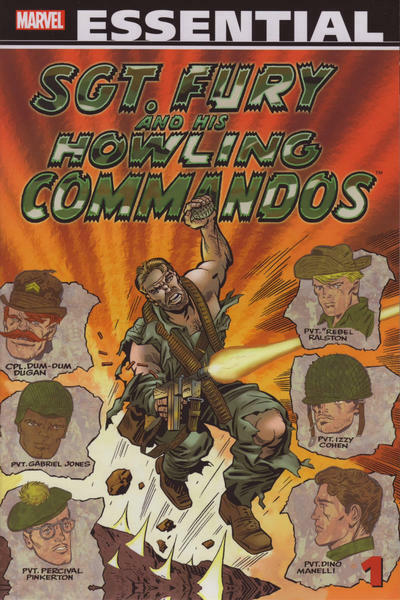 The covers for the two issues are in this volume. Beginning with issue #134, the title of the comic changed to Captain America and the Falcon. 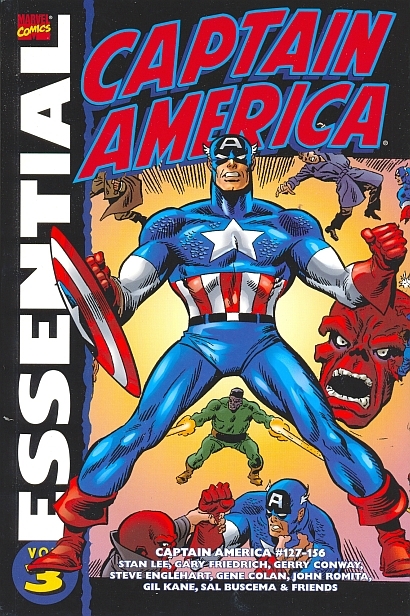 This remained the title until issue #222, which can be found in Essential Captain America Vol. 6. If you like this volume, try: the Captain America movies from 2011 and 2014. In all fairness, this may seem like a cheat. Maybe I am struggling to find another book to recommend based on the events of these comics. But at this point, if you are reading Volume 3, you probably have also read Volumes 1 and 2, which gives you 8 years worth of Captain America stories. So you understand who the character is and how he should be portrayed. So jump over to the movies. The 2011 Captain America: The First Avenger film portrays our hero’s origin, using the story from Captain America #255, which is viewed as the definitive Captain America origin, during the Roger Stern-John Byrne run in 1980 (see Essential Captain America Vol. 7). Jump ahead to the 2014 Captain America 2: The Winter Soldier and we see Captain America working with S.H.I.E.L.D., which we have seen a lot in these Essentials. Look at the opening to Captain America #153, as Captain America comes home and finds Nick Fury sitting in the dark. That scene was later mimicked in the movie. Chris Evans visually personifies Captain America in the flesh, even more so than Robert Downey, Jr. as Iron Man. The Captain America films have done an excellent job of aligning the movie character to that of the comic character, They are worth the re-watch to appreciate how faithful they were to the comics.